The Development Committee is a joint committee of the boards of governors of the International Monetary Fund (IMF) and the World Bank (Bank). It is meant to advise the Bank and the IMF on critical development issues and the resources needed to promote economic development. The Development Committee communiqué sets the direction for the Bank in the coming six months. 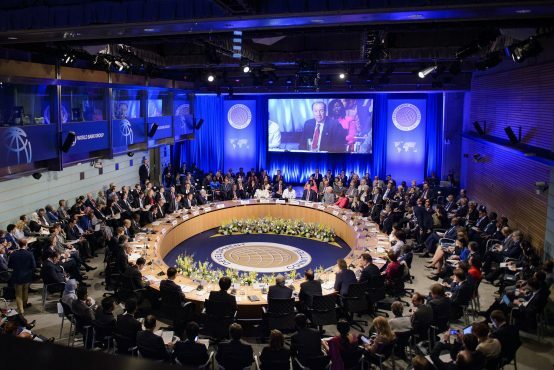 The World Bank and IMF Development Committee met in Washington on 13 April within the context of the World Bank and IMF Spring Meetings 2019. While the validity of allegations of Chinese debt diplomacy is debated, the Committee made oblique reference to it and noted its support for the Bank and Fund’s multi-pronged approach “to improve the recording, monitoring, and reporting of public and private debt, as well as efforts to strengthen creditor coordination in debt restructuring situations, drawing on existing fora.” The emphasis on ‘existing fora’ surprised no one, as the Bank and Fund seem intent on their continued disregard for the proposals, among others, of the 2009 UN Commission of Experts report on reforms of the international monetary and financial systems, which called for the establishment of an “International Debt Restructuring Court.” Indeed, references to the power imbalances which result in differential treatment for powerful and poor countries in the functioning of multilateral institutions – as identified by Barbados Prime-Minister Mia Amor Mottley during her remarks at the Boston University and UN Conference on Trade and Development’s panel discussion on the crisis of multilateralism on 12 April – continued to be conspicuous by their absence in the Committee’s analysis. Likewise, while the Committee highlighted the importance of domestic resource mobilisation (DRM) and the need to address illicit financial flows, it remained unwilling to contemplate the upgrading of the existing UN Committee into an intergovernmental tax body or to recognise the tension between its stated support for DRM and the Bank and Fund’s core ‘enabling the business environment’ policies that, as noted by the tax holiday example given by the Barbados prime minister, continues to force countries to forego millions of dollars in revenues as they compete for foreign investment. These contradictions were particularly evident in the Committee’s commitment to the Human Capital Project, which aims to support increased spending on health and education. The Committee remained unwilling to acknowledge that Bank and Fund policies and the multilateral structures they support contribute to a worsening debt crisis, as outlined by new research by UK-based civil society organisation (CSO) Jubilee Debt Campaign, which noted that average external debt repayments increased by 85 per cent from 2010 to 2018, with a negative impact on public spending on the Sustainable Development Goals, including health and education. Given that the document also calls on the Bank to mitigate investment risks, presumably in line with the ‘Billions to Trillions’ agenda, questions remain about how the Bank and Fund will assist developing countries to address the imbalances of power with increasingly powerful corporate actors. Particularly relevant here is the recent report by UK-based Overseas Development Institute, which notes that every dollar of public development financing ‘leverages’ only an additional 0.37 cents of private capital in low-income countries. As the International Finance Corporation (IFC), the World Bank’s private sector lending arm, will continue to play an important role in ‘leveraging private capital’ and ‘creating markets,’ the communiqué made an oblique reference to the fact that the US Congress has yet to approve its contribution to the IFC’s capital increase agreed at the 2018 Annual Meetings (see Dispatch October 2018). Recent remarks by Chairwoman of the US House Committee on Financial Services, Maxine Waters, that authorisation of the IFC’s general capital increase “will not be a Committee priority” unless IFC investments “at minimum are competitively based and fully transparent down to the amounts and purpose of aid going to which firms and projects,” are no doubt of concern to the Committee. The communiqué outlined the key focus areas going forward in light of the capital increase as: crisis preparedness, prevention and management; situations of fragility, conflict and violence (FCV); climate change; gender equality; knowledge and convening; and regional integration. While the Committee noted that the Bank will increasingly work in difficult environments and acknowledged “the important role that the World Bank’s Inspection Panel (IP) and the IFC and MIGA Compliance Advisor Ombudsman play in accountability, lessons learned, and mitigating risks in an efficient and effective way,” it fell well short of accepting the significant changes called upon by civil society, such as providing the IP with a monitoring role and ensuring systems and resources are available to make complainants whole again if they experienced harm by World Bank-financed projects (see Observer Winter 2018). The language reflects divergences of opinions on the Inspection Panel reform process within the Board, with some shareholders reportedly against a more robust role for the Panel. As the Board must agree on the way forward, the timid language is cause for concern. With no sense of irony given the fact that the World Bank president is again both a US national and a white man, chosen through back-door negotiations, the communiqué noted the progress made on “diversity and inclusion among WBG staff and management” – the selection process for its presidency presumably exempted (see Observer Spring 2019).